First impression? Well the colour was just way too dark for me (ambre doré) so when I started to use it, my skin looked unnatural, but I kept on blending and eventually it came out alright. Anyway, this foundation comes in 21 different shades, so there should be a shade that fits my complexion! 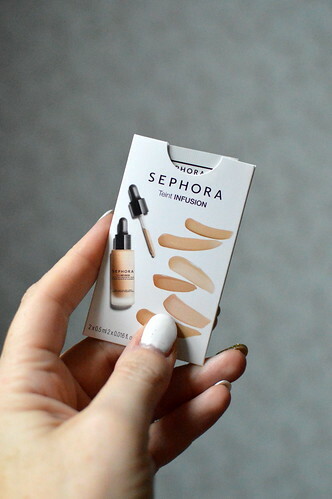 This foundation is light in consistency, blends in really well and doesn’t sit in any creases. It stayed put all day. To buy or not to buy? I’ve still got some different foundations in my bathroom cabinet, but when I need to buy a new one, I think I will give this one a try! First impression? The colour of the sample was ‘ivory’ but this was so much darker than what you’d expect when your foundation is called ‘ivory’! I put on a tiny bit and blended it in really well, so it wasn’t too dark on my skin. This foundation felt a bit ‘dry’. To buy or not to buy? I wasn’t particularly wowed by this foundation, so I won’t buy it. First impression? This sample contained 2 shades: 14 (soft beige) and 21 (petal). I used the darker one (petal) on a night out, whereas the lighter one (soft beige) I used on a day to work. This foundation really ‘infuses’ with the skin. 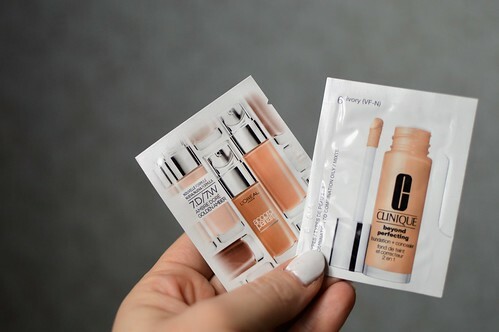 Its consistency is really light and blended into my skin perfectly. The foundation felt very lightweight and evened out my complexion. Have you ever used one of these foundations? Let me know your thoughts! I tried the L’Oreal one when I used to work as a Beauty Advisor. I had lots of colleagues who loved it. Personally I didn’t like it just because it is very powdery. I prefer the creamy ones. Probably if your skin is oily is better for you. But i’ve got combination skin and that is not the solution for my skin. I use the base L’Oréal and sometimes I use trial versions of other companies. But so far I have not found it better than L’Oréal for my skin. Thanks for the review this is helpful. I’ve so many of these and never use them! That’s a brand unknown to me! It’s Rihanna’s new make up brand. In the states, they cannot keep it on the Sephora shelves. They sell quickly.